If you’re looking to organise a corporate festival style event that includes fantastic activities, the best entertainment, unbelievable cuisine and exceptional memories, we have the experienced festival managers and outstanding ideas to help you create it…and then some! Whether you are looking for a ‘festival of fun’ or a ‘euphony of music and activity’, what better way to celebrate and say thank you than by bringing together your guests to enjoy a great day full of activities, entertainment, rides and live music. Whether at a venue of your choice or at our exclusive use 150 acre Mythe Farm venue, we can help you create that magical and memorable experience. With your flags and banners waving proudly on the arrival of your VIP guests, the glamping site and main event field come into view and raise expectations to something very special. The main festival field could include a variety of spectacular marquees and structures creating the focal point for the event and Garlands Corporate has the experienced festival managers to create your perfect bespoke event package. These structures could include a mix of duospan marquees, tipis, yurts, traditional marquees and so much more. For the true festival experience, we can provide your guests with overnight accommodation in luxury glamping tents and yurts; with pamper tents, luxury toilets and showers. As they arrive, guests will be directed by our friendly event staff for parking and allocated their luxury glamping tent to settle in before walking across to the main attractions in the festival field. Dominated by the festival marquee and stage, excitement mounts as they are met by stilt walkers before exploring the surrounding activities, food stalls, attractions and displays laid on for them at this ‘festival of fun’. Alive with vibrant colours, sounds and aromas, a variety of street stalls cater for every taste near to the main stage. Music pervades the air as the afternoon builds with live performances by professional artistes to entertain your guests. With a beer tent to quench thirsts and street food to please all tastes, excitement mounts as the ‘festival of fun’ has just begun. The evening peaks with a band of your choice providing a show stopping visual set on the main stage. Whether your event requires a particular look, feel, atmosphere or theme – your dedicated festival event manager will advise and help create this and more! Corporate festival events come in all shapes and sizes – and there are not many festival style corporate events for clients that our exclusive 150 acre Mythe Farm cannot accommodate, creating a real festival style ‘day to remember’ for all your guests. With our stunning rural location, the spacious Event Fields are ideal for a variety of corporate festival style events for over 600 guests such as summer parties, family fun days, company anniversaries, or rewarding employees. It could include some of our many on site activities, live music, fairground rides, fete stalls and many more festival style event ideas. Mythe Farm is simply the best outdoor corporate festival event venue in the Midlands for global, UK-wide and Midlands based companies – Garlands Corporate Event Managers help create a unique experience for your ‘day to remember’. Your dedicated Festival Event Manager will discuss in detail the objectives of your event, all aspects of design and delivery, creating a bespoke package that meets your needs including budget. Call now on 01827 722201. "thanks to all of your team for ensuring that Zizzi Fest was such a superb hit"
"The best of all the days." 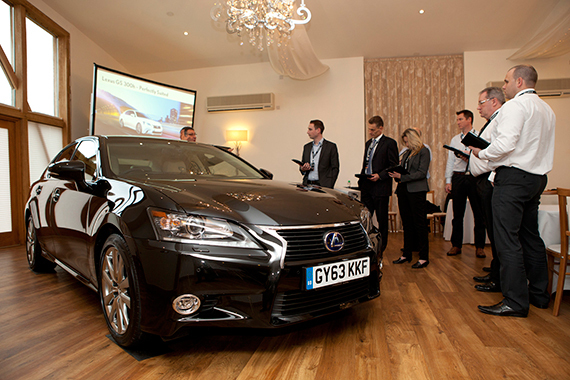 For automotive and product launches we have a number of spaces that can be utilised for a variety of promotional events. Mythe Barn is a stunning venue for a Christmas party, dinner dance evening, gala dinners, casino nights and much more! With plenty of room for more than 300 guests, Garlands Corporate is the ideal conference venue for the Midlands – and then some!